Realizing high-resolution programmable matter requires millimeter-scale catoms. 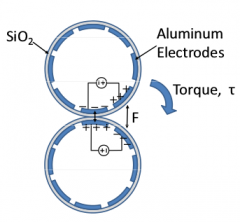 Within the Claytronics project led by Carnegie Mellon University, researchers have developed and demonstrated millimeter-scale cylindrical catoms that are electrostatically actuated and self contained. As a simplified approach cylindrical catoms were first built instead of spheres. We name here these cylindrical catoms the 2D Catoms. 2D Catoms have been partially validated with the realization of a hardware prototype. A 2D Catom consists of a 6-mm long-and 1-mm-diameter cylindrical shell. 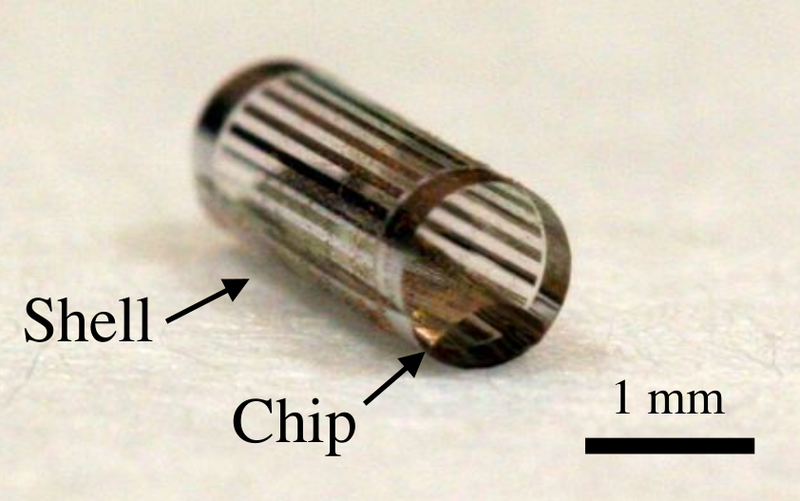 A high-voltage CMOS die is attached inside the tube. The chip includes a storage capacitor and a simple logic unit. 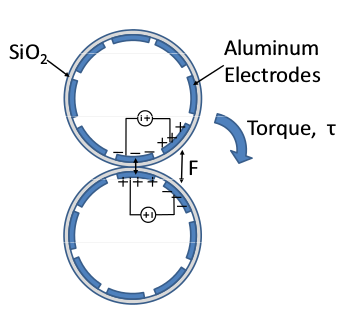 The tube uses electrodes for power transfer, communication and actuation. In the current design, a 2D Catom can roll on a power grid. A 2D Catom is theoretically able to perform a revolution in 1.67 seconds or 3.35 seconds. Karagozler, M. E. (2012). Design, Fabrication and Characterization of an Autonomous, Sub-millimeter Scale Modular Robot. PhD thesis, Carnegie Mellon University. Karagozler, M. E., Thaker, A., Goldstein, S. C., & Ricketts, D. S. (2011, May). 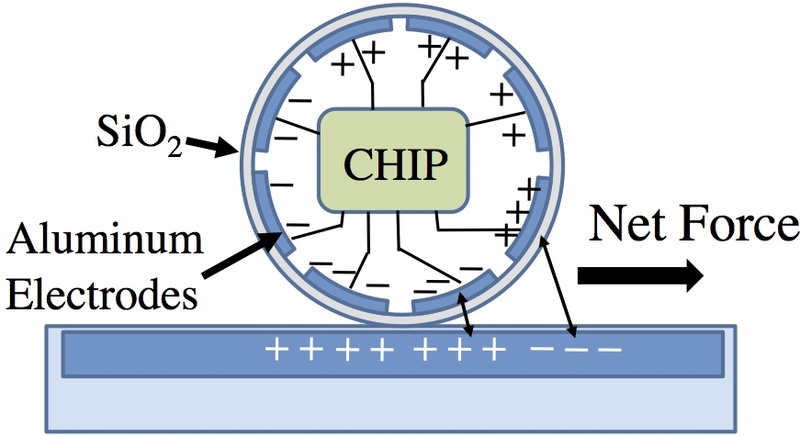 Electrostatic actuation and control of micro robots using a post-processed high-voltage soi cmos chip. In Circuits and Systems (ISCAS), 2011 IEEE International Symposium on (pp. 2509-2512). IEEE. Karagozler, M. E., Goldstein, S. C., & Reid, J. R. (2009, October). 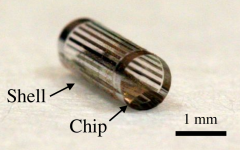 Stress-driven mems assembly+ electrostatic forces= 1mm diameter robot. In Intelligent Robots and Systems, 2009. IROS 2009. IEEE/RSJ International Conference on (pp. 2763-2769). IEEE. Karagozler, M. E., Campbell, J. D., Fedder, G. K., Goldstein, S. C., Weller, M. P., & Yoon, B. W. (2007, October). Electrostatic latching for inter-module adhesion, power transfer, and communication in modular robots. In Intelligent Robots and Systems, 2007. IROS 2007. IEEE/RSJ International Conference on (pp. 2779-2786). IEEE.